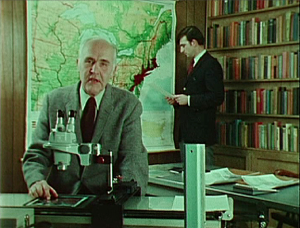 Robert Simpson and David Lindgren from Dartmouth College discussing their early Landsat research on urban sprawl along the U.S. northeastern seaboard in 1973. May 8, 2014 • The Landsat program is the longest continuous global record of Earth observations from space—ever. On July 23, 1972 NASA launched the first satellite in this program, then known as ERTS, the Earth Resources Technology Satellite and later renamed Landsat 1. In 2012, for the 40th birthday of Landsat, NASA edited together selections of an archive video from 1973 about the ERTS launch. Featured in this 1973 video was a senior geologist at NASA, Nicholas Short, and at Dartmouth College, Robert Simpson and David Lindgren. NASA and the U.S. Department of the Interior through the U.S. Geological Survey (USGS) jointly manage Landsat, and the USGS preserves a more than 40-year archive of Landsat images that is freely available over the Internet. This entry is filed under News, Throw Back Thursday, Video.